I have one of these. Might be the plastic welt version, not sure. One of the panels basically wore off. I cut the leather out about half way up and Gorilla glued down what was left. The bag hits just as well on the bare nylon as it did on the leather. Go figure. Not pretty to look at though. Can anyone post a pic of the kidskin 4200 with LEATHER welted seams? I think Enkay already built the better mousetrap with their orange latex bladders. If you read through the patent (for which they are still under), there is a hell of a lot of technology that went into it. The inventors were well aware of what makes a good speed bag bladder, and the trade-offs involved between latex, butyl, and plastic. That's interesting. Enkay are good bladders, Title would do well to use them as original equipment. The Everlast plastic bladder did give good bounce as I recall, but failed too often on initial inflation. If you got a good one they worked pretty well if my memory isn't faulty. Awesome you got some old school kidskin bags. RDShack got me into the older bags. And I also love hitting the 4200 bag, but not too much as it still has a working plastic bladder in it and I always worry about it when I add air. The Everlast leather from back in the day is great. I have a 4213 military and that leather is absolutely awesome. since the bag is basically unused. Today's Everlast bags are okay, but I am not a fan of the banana hot dog shape. I've written Title and asked that they make a Kangaroo Vintage throwback bag. 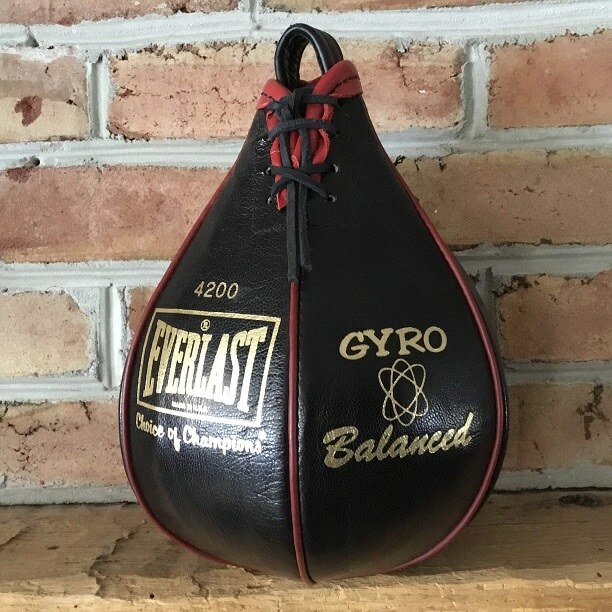 Make it look like the Title Gyro (4200 Everlast) with a light weight Kangaroo skin construction. Leather welting and an Enkay bladder. But the key is to make it bounce like the Perilous bag but shape it like the Title Gyro. Have a picture of a boxing Kangaroo wearing a T Title emblem shirt and their Gyro icon and sign me up for all the sizes they make of it. Wow, sign me up for one. Original red plastic bladder still holds full pressure since I inflated it over a year ago. You could see why some of those red plastic bladders would fail, it was the ones where the heat seal seam was too close to the edge. Seems to me the quality control was shoddy, not the basic idea. I had only the bigger sized bags and rebound was good in those sizes. Not sure about smaller bags. But one year retention of air pressure is wild good performance.